We’re on the homeward stretch, folks! 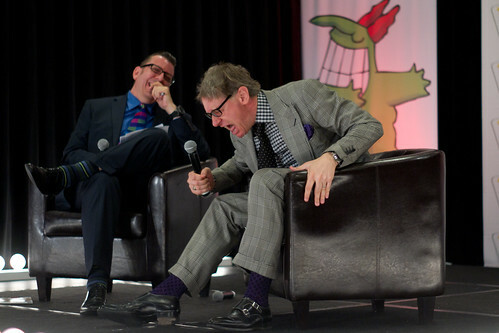 Here’s what Paul Feig had to say during his “Master Class” at the Just For Laughs Comedy Conference, interviewed by Richard Crouse. For the auditions, “what we like to do is write sides that aren’t in the movie”. Long paragraphs that let them show their personality. There’s also an improv component. Rose Byrne was chosen as the nemesis because she wasn’t a comedian. “It was coming out to be too arch if we had a funny woman doing it.” She was able to base it in reality. 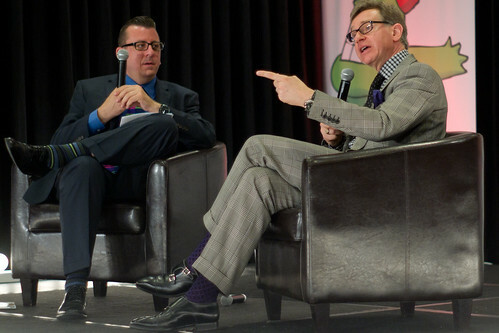 Feig noted that Steve Carell does the same thing, grounding everything in reality, and the funny things turn out to be funny. “My problem with a lot of comedies is that they’re built from the comedy down. You really have to face it as a drama.” If you’re on board with the characters and the emotional aspect then you’re in a better position to add the comedy. They held eight test screenings for Bridesmaids. The structure didn’t change, but individual scenes and jokes did. Judd Apatow and Greg Daniels are great to work with because “both of them are brilliant at knowing that we don’t know”. I am just so utterly greatful to you for this article, Sharilyn. Very fortunate for your reporting on all these different JFL festival events. Definitely a FAN of your and your brain! Thanks Cat! With all these ego strokes, I’ve become quite the fan of yours as well!